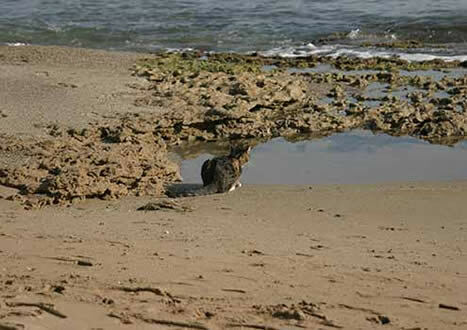 It is a country-wide problem here in Greece, the poisoning of feral cats. However, it is not only the wild feral or strays that get culled in this manner; it catches domesticated or semi-domesticated animals, such as Doodle. 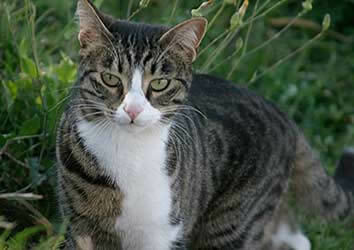 With the lack of will and education, there is a stigma against neutering the large population of feral cats. High vet bills of over 100 Euros to sterilise a feral, encourages a dormant attitude to deal with the problem in some humane way. So, no neutering results in a yearly explosion of wild cats that feed off tourists, and an abundant supply of rodents during the summer, and then the communal dustbins during the winter. Bins from which they will get infected with disease. They do not have very long lives, often poisoning themselves from eating something from human garbage. If they get through the first twelve months, they are doing well. The belief that the natural way is to allow them to breed – up to six kittens twice a year from each feline – results in an explosion which is then counteracted by the not so moral of the populace by poisoning. A rat poison that produces a slow and horrible death. There are several types of poison, some more obnoxious than others. I found one cat on our driveway two years ago. It was stretched out as asleep. By the mouth a blood-stained tarmac and a discharge also from the rear end. In Doodles case the poison was to be believed a milder one, it took four days to shut her body functions down completely before she died. It started at 7.30 am, just after she arrived home. Within minutes, she started to throw up, but nothing would come out. This is normal for her as she eats lizards. After half digestion decides it does not taste that good, then regurgitates a messy lizard-like shape of sick. This quite naturally is what I thought was going on. However, she retires very miserable to the cosy bed where she constantly makes complaining meow sounds. After an hour or so it got worse, her meow turned into what must have been cat screams. I did not know at the time, but the poisoned must have been getting to her kidneys, once these had been destroyed there was no chance of her surviving. She had lost her energy and could now hardly stand. One or two metres and she would collapse onto the floor as she tried to reach her water bowl. She was rushed to the vets, placed on a heated bed and put on a water drip feed for the night. The vet at this point could not determine what had got into her system. Her temperature was down to 36 degrees from a normal 39 degrees. This is a near mortal state, if her temperature drops any more she will die. So for the time being, this was the only option open. A blood test would have been more conclusive, but at 99 Euros, it was beyond my means to afford. Then there would be the cost of any medication, which had no limit depending on requirement, or even an operation to save her if it was needed, or if it was possible. It is hoped that the mild poisoning would be washed out of her system overnight. She should be better in the morning if this was nothing serious. However, the next day when I arrived at the vets, she was no better. She was in a large heated cage still with the drip tube attached. As I walked into the room, she meowed with recognition. She tried to raise herself to greet me, only to find she did not have the strength to do so. Her neck muscles trembled and quivered as she applied force to get up. To stop her struggling more I stroked her, giving her some comfort and security. She must have been quite anxious and lonely during the night, maybe even frightened. Several injections later we were on our way back home. After resting her on the bed and covering to keep her warm, she instantly got up and fell onto the floor. With no energy to go anywhere, her tongue was lashing out of her mouth; her eyes pleaded with me. I took this as an indication that she was thirsty. I produce a bowl of water which she lapped dry in seconds. Producing another two bowls had the same result. This I thought was promising, but before I could get her back onto the bed, she threw up the lot. At the time, I did not understand she could no longer process any fluids or food. I believe her kidneys had already failed; this meant any food going in would only poison her more. Without the expensive blood test, there was no way to tell for sure. Picking her up and covering her up again on the bed, I cleaned up the mess. All I could do now was play nurse and hope for the best. I am going to insert photographs of Doodle through this account. Like most cats loved climbing trees. A restless Doodle would not stay put. Her thirst soon drove her off the bed. She plonked on to the floor with no natural graceful movement, picked herself and walked several metres into the kitchen before she collapsed. I watched. I decided to let her do what she felt she needed to do. She was heading for the very large water bowl at the far end of the kitchen. After a few minutes, she raised herself up and completed her task. Here she stretched out on the floor; head over the bowl took very small licks of water, and then waited a time before she took another. It was now clear she understood she could not take in and retain fluids. She gauged very minute amounts; I waited to see what would happen, then take some more if it did not come back up. It was heart breaking to watch. She spent the next several hours in this position. The kitchen floor was stone tiled, cold and not good for her body temperature. I had to pick her up and put soft warm sheeting underneath. She was limp and there was no resistance in her body. I carefully placed her back down with her head over the water bowl. As the days went on she would try to reach different places around the flat, but would not get far before she collapsed. As there is little carpet and only tiles, I proceeded to put towels and blankets all over the place. If she tried to get around, a least if she did not get far there would be a warm surface to lie on. I also put a blanket over her while she lay there, but minutes later she had crawled out into a different position. It was obvious this was going to be a difficult patient. Over the next few days before she died, this tussle would continue. No matter what I did to keep her warm, she would not have it. Yet, when I made an account of this to the vet, he found it surprising as she must have felt cold inside. We were to visit the vets again, but Doodle would be considerable worse by that time. Several hours later she made her way back to the large double bed in the sitting room. Passing the food bowl on the way, she tried but had no luck at keeping anything in. She would sit, if she could, then lie, almost sniffing the dried small biscuits. Her legs would wobble under the strain of trying to sit; it was not long before she gave way. At this point she could still muster the strength to leap back onto the bed. Here she would lie with sad meows. All I could do was hope and try to keep her warm. She would leave the bed on occasion and make her way back to the water bowl. Sometimes she would explore some of her favourite places around the home. This always resulted in me lending a hand and bringing her back to the bed, as she would collapse somewhere and not be able to get any further. I had several medicines which I had to administer. One once in the morning and another one every eight hours. I had to crush the tablets then dissolve them in water. The implement to help get Doodle to take this was a small syringe, without the needle of course. I would grasp her neck, and with the head held backward, induce into the side of the mouth to the rear. She would gulp the fluid down as she was severely dehydrated. I tried liquid food in the same way, on all occasions it would only stay in her for a few minutes. On a few occasions the medicine would stay inside, but at other times it would not. She would sleep on my bed at night and would constantly ask for attention. Strokes to comfort her and keep her warm. I remember those sorrowful meows. I would get woken up in the middle of the night from the thud of her body as she hit the floor. I would then see a tail disappear into the kitchen. I would lie and wait for her to return. On the next-to-last night, she could no longer get herself back onto the bed. Her strength was slowly diminishing. I would get up and help her up as she struggled but fell back to the floor. She would just lie there until I picked her up. From time to time, she would have another strong spasm of trying to get something out of her system. Nothing ever came out; she was clinging to life now and was not prepared to give up. This is how it was for those last three days of her life. About 4pm on this next-to-last day, I lost track of Doodle. I heard the squeak of the cat flap, and not spying her anywhere of the usual; I peered through the glass of the sliding doors only to catch her rear end disappearing around the low alcove wall. The cat flap is jammed between one of the sliding doors and the frame. The resulting gap above is filled with cardboard crammed into the window grooves and taped; this stops the wind and drafts where there should be glass. The reason for this is that this is rented accommodation, and I do not want to create any damage to the doors. This was the only alternative that I could fathom out giving my three cats free access at all times. It was hidden behind the bunched up open curtain and could not be seen, simply heard. I dashed out through the door in fear of her disappearing somewhere and could not be found. I need not have worried though, as only a metre further she had collapsed. Meowing, she looked up at me with large sad eyes. The draw of the outdoor had over taken her will. I have seen this before in Delilah. I understood what she wanted, but I could not leave her to wander off on her own. I picked her up and bought her back into the flat. Before I had had time to put shoes on and dress properly, she had managed to drag herself outside again, well nearly. This time she was stuck halfway through the cat flap before her energy gave out. I stood and tried to encourage her to come all the way. She did after a few minutes and managed a few metres before resting. She stood there shaking, struggling for strength, then after another few metres towards the beach; she collapsed. I sat with her, after a while she managed about another five metres and collapsed again. I picked her up and carried her to the grassy area with the Mulberry tree she knew so well and had spent most of her time as a kitten. We spent the afternoon here; she snoozed in the warm sun and stared at the ocean nestled in the long grass. I sat in a chair close by and kept watch. At one point, she stood up and attempted to dash towards me as was her custom. However, she only managed a few paced and wobbled sideward and ended up on her side. I quickly went to her aid, picked her up, then sat back down and placed her on my knees. We spent some time like this as she enjoyed all that she knew. I did not have the heart to take her back inside, even though I eventually would have to. I sat on the bank and watched, andwondered. What was she seeing and contemplating? It is now getting dark, about 8. 30pm. She had left my knees and would slowly wander around the grassy patch. She could not get far. I left her for a few minutes and returned with a large blanket and a sun lounger. Placing the lounger under the Mulberry, I wrapped myself up in the blanket for protection from the chill and got comfortable. Doodle took the hint and attempted to get onto the lounger with me. I lifted her up and wrapped her in the blanket on my chest. Here we rested together for about another hour. It was dark and the stars were in the heavens. At this point I did not have much hope that she will pull through. I can merely do my best for her, and if she wants to be surrounded by the nature she is familiar with, then that is at most only a little burden on my part to grant her that desire. Quite cool actually, I ought to do this more often. We lay there and I stroked her; a tear would appear in my eye as I tried to understand her suffering. Suddenly, she wriggled free from the blanket and fell upon the grass floor. She made her way to a gap in the wall which led out onto the road, and then into a field she had played in so many times. She stalled in the gap, with only her front paws and head through; she took in the scene. I am not sure that if she had had the energy she would have carried on, or was she content just see the view again. Maybe she knew she was dying and wanted to be alone. To find a place just to rest in peace, then pass away when the time came. I watched for a few minutes, but could not allow her to go any further. The call was strong, but I was stronger. Enough was enough, I gathered the blanket and Doodle under that night starry darkness and headed back to the safety of the flat. Placing her gently on the bed, and then attempted again to feed and minister some medicine. It was about 1 am in the morning, there was a thud and the familiar sound of Doodle trying to throw up. She was on the floor at the end of the bed. The spasms were the worst I have seen her go through. I watched, pondering if whatever it was that was inside her will eventual come out. Nothing, she lay there limp and did not move. I gave her a few more minutes; I wondered if she was dead, but the twitching of the ears gave that away. I lifted her up onto the bed; she had gone completely limp now. The only thing she could move was her head, mouth and tongue. I wrapped her in a blanket and spent the night awake with her. This would be last time Doodle would ever walk again. Ten o’clock in the morning we were at the vets. There was no life left in her body. The vet came up with some startling insight that prevented the decision being made to put her down. If there is hope, then that is what we run with. When an animal is still alive, but dead, or one might say the creature has given up hope. The body is total limp, so is the head, mouth and tongue. There is no movement at all; the animal has died inside even though it is still breathing. This is the time to put it down. However, with Doodle, even though her body had now completely given up, she could not operate her muscle to move anything; her tongue, mouth and head were still active and was asking for water after the manner she normally does. This was a sign that she had not died inside and was fighting, still very much alive. She still meowed and was seriously dehydrated. It was not right to take her life away if there was still hope. Her body temperature was still at 36 degrees, dangerously low. I had to explain how difficult it was to keep her covered. She was given some injections to try to get her body moving again. We were down to the last resort, if she had not improved by the morning, then ending her life would be the consideration. When we arrived home, she was placed upon the bed and covered instantly. As she could no longer move, she had no choice but to stay under the covering. I made a hot-water bottle from a wine bottle and covered it with cloth, then placed it next to her body to provide heat. It is now about 11.30 am. It was hard to watch. She would meow; her legs and paws would twitch as she tried to motivate them to move, but could not. It was as though she was confused by the lack of response. I stroked and comforted her as much as I could. I syringe fed her with water, medicine and some food. Even though she was eager to take it in, she rejected all a few minutes later. I remember her eyes as she looked up at me with each attempt to get something inside of her, still full of hope. A short time later I was lying with her on the bed, just her head, whiskers and ears could be seen above the covering. I close my eyes after a while only to be aroused by very heavy breathing. She was now struggling for breath. I phoned the vet; the verdict was that it was not looking good. Those last injections had not worked. The sadness I felt was overwhelming, it was not just the fact that she was going to die; it was all the suffering she had to endure. The battle for life was being lost as the body slowly broke down one piece at a time. Whoever gave her this poison must be heartless. How could you do this knowing that this was going to happen? Of course, it is more likely that they have not a clue how death occurs from this sort of action. It may not have been given to her directly, just left for whatever came across the deadly food. It could have been secondary poisoning, but I find this difficult to believe. 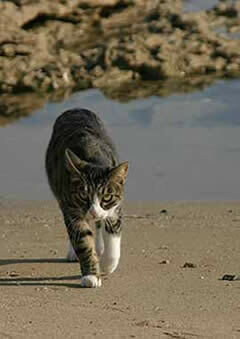 I know like many others that rat poison is used to cull the feral cat population. I have two cat feeders, each with a different flavour of dried food available 24 hours a day. My cats can graze at will. They get canned meat in the morning, so they have no need to go elsewhere or feel hungry. They still catch and eat mice and voles, but that is live food. The provision is there in the hope that they will not eat anything that is not alive outside of the flat. It kept them living for two and half years, when most of the feral cats never make it past their first birthday. It is now clear Doodle is not going to live. Her body has been breaking down steadily over the last four days. The latest thing to go was her lungs as she grasps for breath. I wondered, was she clinging to life because I was there? I could not bear her going through this all night until the vets at ten the next day. That’s another twenty hours. I thought about going for a walk and give her some peace, but at the same time I did not want her to suffer alone. Half an hour later I shut the door behind me and wandered down the beach. A few coffees afterwards I returned to find that Doodle had passed away. I feel guilty about leaving her; it haunts me. Was she calling for me with her last few breaths, did she panic in her loneliness and get desperate trying to get up? Alternatively, did she just decide it was time to give up and slipped away peacefully; I will never know. Could we have done this differently that might have saved her life? If I was richer I could have afforded the 99 euros for the blood test. Could I have stopped the four days of suffering knowing she would not live? It cost 65 Euros for the vet and drugs just to try to keep her alive. I took the top off the cat box and lined it with a soft sheet, then rested Doodle in it. Dodo her sister was perched upon the computer table. I took Doodle over and showed her, her deceased sister hoping she would understand. I do not think she did. She was looking for Doodle weeks later. Doodle had a favourite sleeping place onto of the wardrobe cupboard in the living room. The amount of time’s DoDo has stretched up, or glanced up to that place over the weeks is more than I can count on my fingers. I think she mourned in her own way; she started doing things she had never done before. I think she knew Doodle had gone, but was not quite sure and expected her to turn up at some point. I left it until the next day and then took Doodles body down to the beach. I chose a spot under one of the trees that shaded the sand. I dug a hole about a half a metre deep and laid Doodle to rest. I covered her with sand, put a layer of rocks and then covered with more sand. On the top, I placed the large piece of rotted driftwood she used as a scratch pole. Next, I pressed it into the sand to keep it firm. I placed another tree log against that, then more sand but leaving the wood so it was visible. I do not how to explain the grief. Not so much a teary one, just pain that accompanies loss. I missed Doodle almost immediately. It was not as bad as losing a human companion, but bad enough. I was surprised just how one gets attached to animals. I did not know it until at that point that there was any real attachment; I thought they were just there. However, life has to go on, enjoy your heavenly existence without the worries of this world Doodle. Do cats go to heaven? Many would debate that, I believe they do. The inscription on the image below. 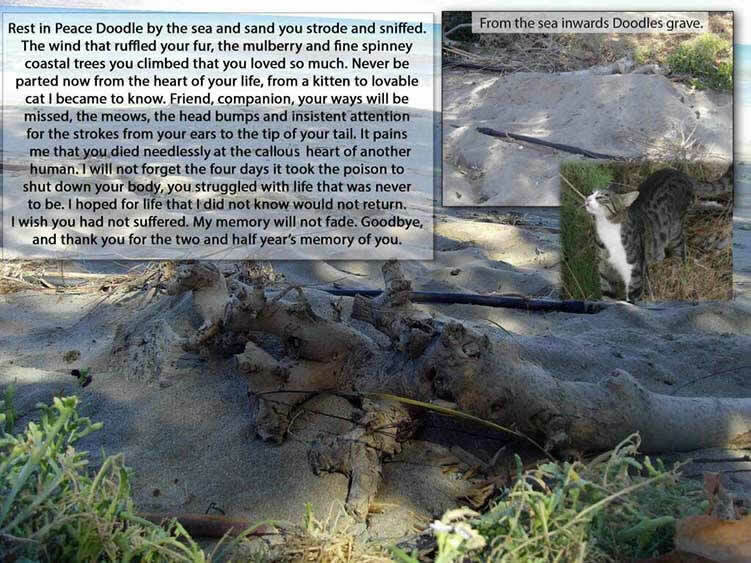 Rest in Peace Doodle by the sea and sand you strode and sniffed. the Mulberry and fine spinney coastal trees you climbed and loved so much. from a kitten to lovable cat I became to know. 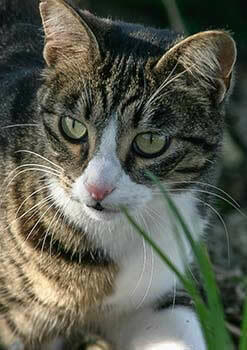 the head bumps and insistent attention for the strokes from yours ears to the tip of your tail. It pains me that you died needlessly from the callous heart of another human. you struggled with life that was never to be. I hoped for life that I did not know would not return. I wish you had not suffered. My memory will not fade. and thank you for the two and half years memory of you.